Katie Ann Mayhew with Santa above the Arctic Circle. I have been a mother for 68 years and a Nana for 30 years, but for one short period of my life I was a Nanny. When I looked up the definition of a Nanny on the internet, I found two meanings: a woman who is the custodian for a child, and a female goat. I fell into the first category. When my third granddaughter was born in May of 1992, her mother, my daughter Deborah, was an active computer consultant. She was a single mother, and that summer when she accepted a one-week consulting job in Helsinki, she was faced with a dilemma. Not only did she not want to leave her baby, but she was still nursing, and planned to as long as she could. Although it had been some years since I had actively cared for a baby, I had been Deborah’s Lamaze partner and was with her during her labor and for the delivery of Katie Ann. So it seemed natural that my daughter turned to me and invited me to accompany them on the trip to Finland. She sweetened the pot by promising that when her work week was over, we would take a side trip to Lapland, above the Arctic Circle to visit Santa Claus land. Katie Ann was four months old when we boarded a Cape Air flight to Boston in early September. From Boston we flew to Helsinki on a Saturday, checked into the Royal Hotel, a very nice business hotel, and were able to rest and explore a little of the city around our hotel over the weekend. Deborah had rented a baby carriage and brought along all the necessary items to keep a baby happy for two weeks. Deborah is a very organized woman (she claims she got it from her mother, so maybe we made a good team) and she had arranged to express her milk each day into a special container. On her way out of the hotel each weekday morning, she checked the container of breast milk with the concierge at the lobby desk, who put it into a refrigerator labeled with a number. When Katie Ann’s next feeding rolled around, I would go down to the lobby and claim the milk. After the third day that I did this, the concierge said, with a smile, “You really don’t have to produce a claim check anymore, because no one else is checking in breast milk.” I felt a little embarrassed as the only other hotel residents seemed to be men in business suits, and I was an elderly lady with a baby in a carriage collecting breast milk in the middle of the lobby. What were they thinking? I would put Katie Ann in her carriage each morning after I fed her and changed her diaper, and we would go for a walk down to the open market by the Baltic Sea, or to the three storied enclosed mall with musicians playing on every floor. When Deborah returned at the end of the afternoon, we took Katie Ann and went downstairs to dinner. One evening we ventured out to a restaurant where we dined on reindeer meat and cloudberry jam. Katie was an easy baby to care for — as long as she was fed and dry, she was content in her carriage, and slept through the night in the crib supplied by the hotel. On Saturday, after Deborah was through her work week, we ventured further into Helsinki and explored the city. The next day we flew north to Rovaniemi, just above the Arctic Circle where we visited a reindeer farm and Santa Claus Village. 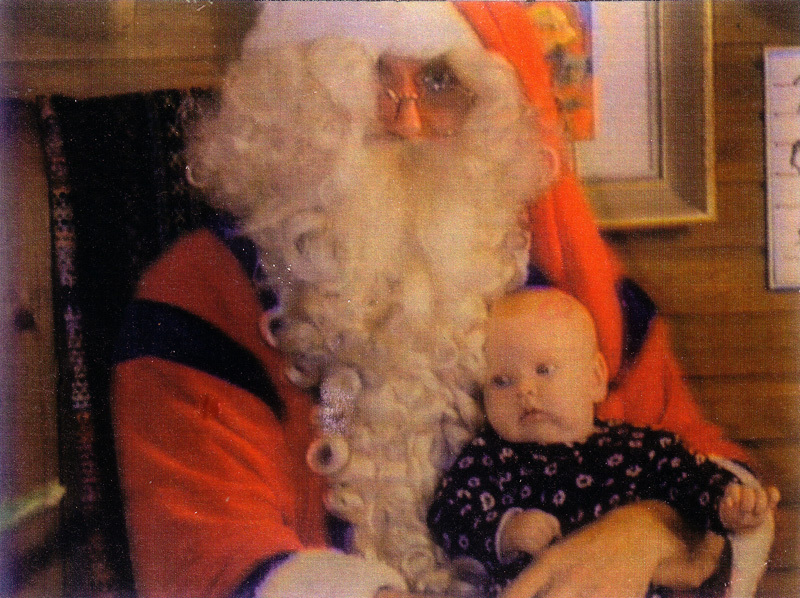 Since it was only September, Santa Claus was not too busy yet to pose with Deborah and Katie Ann. Our return from the reindeer farm to the city of Rovaniemi was on a small open boat on the Kenijoki River. Throughout all these adventures, Katie Ann was placid and accepting. It is easy to travel with a small baby — Katie Ann didn’t seem to notice that she had left the small village of West Tisbury on the small Island of Martha’s Vineyard in the large country of America to travel across the world to Santa Claus land, long before she became aware of who Santa Claus is. But for her fortunate Nanny, it was a lovely adventure. No doubt hearing those musicians in the Helsinki Market was a major early influence in Katie Ann's (Siren's) musical development. And her grace, her poise, and beauty can be traced back to her mother and grandmother. What great memories for you and 25 year old Katie Ann! I just love reading your stories. Merry Christmas! Love your stories. This one sounds like a wonderful trip.